HEAR YEE, HEAR YEE I can Hear!! Today I am celebrating sound, it has been a year since I had ear surgery. I am a 58-year-old Wife, Mom, Grandma and full-time worker. I was diagnosed with Otosclerosis when i was 40 and already knew my hearing was becoming a problem. I started to wear a hearing aid and it helped for a number of years, but as my hearing got worse, the hearing aid could not carry it. I struggled at work and at home with hearing, when my 4 year-old grandson told me a story with excitement and I had to have him repeat it and then still missed most of it and he sadly said "nevermind Grandma", I knew it was time. I live in Saskatchewan, but the surgery required to repair the ear (Stapedotomy) was not available here. I was referred on to Dr. Ho in Edmonton. I was hesitant about the extra travel and appointments, but after speaking with Tracey (Dr. Ho's assistant), her friendliness and eagerness to accomodate was above and beyond. When I met Dr. Ho, he gave me his undivided attention, explained and answered all of my questions, and made me feel very comfortable. 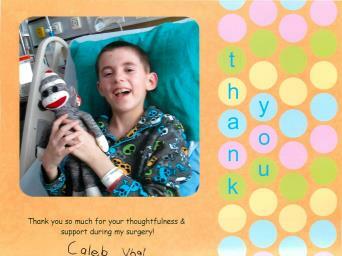 Within three months, I was in Edmonton for surgery. 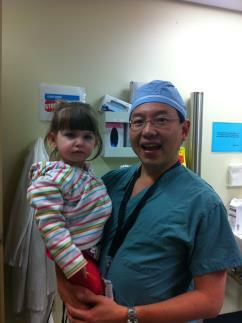 Dr. Ho spoke with me before surgery and was there after to tell me what to expect in the next few weeks. Once the healing process was on the way and the hearing was coming in loud and clear - I was so amazed at the things I could hear that I forgot about over the years; the wind in the trees, the sound of the furnace, the birds, the sound your sheets make, the roll of the thunder, and your grandchildren whispering. I am still amazed by what Dr. Ho and this surgery gave me. Thank you. Over the last few months since Ashlyn has had the implants turned on, she's gotten to be quite a noisy little girl!! She makes all kinds of sounds now and turns her head towards sound too. We're at the point where we're trying to decide if she's responding to her name, our voices or simply just sound - it's so hard to tell sometimes! She mimics us with her sounds and is even starting to use her voice to get people's attention/engage in "conversation". Her audiologist and speech therapist are happy with the progress she's making. Although we know there's still so much more work to do, the amount of change we've seen over the last few months is truly amazing. Thanks again for everything!